Halfway between Elmira and Corning, New York, lies the Town of Big Flats. This is the area that the Delawares had called Atsingnetsing, the place of great stone. This is the place where in 1779 the Clinton-Sullivan expedition destroyed Runonves, a Seneca hunting village. Yet, if an historical marker is placed here, it will be dated April 13, 1898. On this date Martha Robertshaw was born. 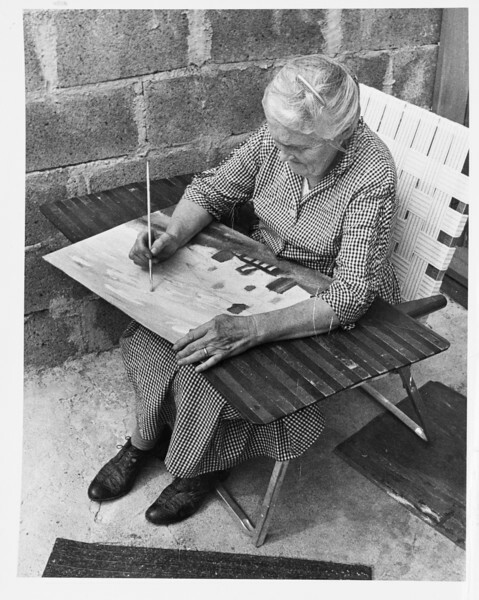 Martha Robertshaw, American primitive artist, was the oldest of the seven children of Nelson E. and Harriet Miller Robbins. 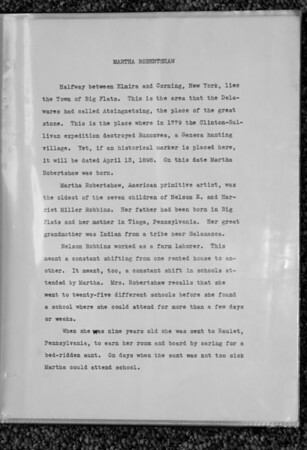 Her father had been born in Big Flats and her mother in Tioga, Pennsylvania. Her great grandmother was Indian from a tribe near Salamanca. Nelson Robbins worked as a farm laborer. This meant a constant shifting from one rented house to another. It meant, too, a constant shift in schools attended by Martha. Mrs. Robertshaw recalls that she went to twenty-five different schools before she found a school where she could attend for more than a few days or weeks. When she was nine years old she was sent to Raulet, Pennsylvania, to earn her room and board by caring for a bed-ridden aunt. On days when the aunt was not too sick Martha could attend school. A year later, on the death of the aunt, Martha began a constant shift from home to home in neighboring Pennsylvania communities. She did chores and cared for young children to "earn her keep." She attended school in Horse Run, Pennsylvania, in Kibblesville, East Sharon, Bloody Corners, Plank Road School, Upper Horse Run, Shingle House and many others. She says of this period that school was not required by law and she did not go often. It was "like visiting." When she was thirteen she returned to Big Flats to live with and to care fo her grandmother. Here, though attendance was irregular, she was able to attend "old brick" school from the fourth through the ninth grade. Her her interest in art grew. Though her grandmother discouraged her art activities as a foolish waste of time, Martha took advantage of what art activity the school offered. She did well in class. She joined the Achievement Club (similar to the 4-H organization of today) an did many paintings for them. In 1917 Martha went to the Railroad Commercial School and learned telegraphy. Then for several years she worked in stores, went out nuring an dheld various odd jobs. On June 19, 1924, Martha Robbins married Charles C. Robertshaw. Their marriage lasted for thirty-four years. During only nine years of this time was Charles able to work. He had been a gas victim in World War I. This left him with lung weakness. In 1942 he became bedridden. He wanted the seasons, the hills, the river, the trees - all the outdoors from which he was shut away. Martha brought them to him. Under her brush the ceilings of the little house turned to sky. The walls became the hills and valleys, the rivers and woods, the farms and pastures of Chemung County. The seasons and their changing colors were again there for a sick man's eyes. A little unpretentious house in Fisherville had been changed into a place of magic. In 1950 the Elmira Star-Gazette did a feature article about the mural. This brought Ernfred Anderson, the curator of the Arnot Art Gallery, to view them. Shortly after this Mrs. Robertshaw was voted in to the Elmira Art Club. Mrs. Robertshaw's need to create in her art form permeated every segment of her life. Church and God were important to her. During her years with her grandmother she had attended the Big Flats Presbyterian Church, but she considered herself a Wesleyan Methodist like her parents. In Fisherville there was no church. She attended the Baptist Church in Horseheads. About 1945 Mrs. Robertshaw, helped by Mrs. George Wells, began to have regular tuesday night young people's bible class meetings in her home. On wednesday nights adults came to prayer meetings. From a few in attendance the group grew to about thirty Many who came to these non-denominational meetings were Fundamental Baptists. In the late 1940's the Reverend Floyd Harris, who now serves as pastor to a Long Island Baptist church, and the Reverend Beck with, who is now a missionary in Africa, were sent to Fisherville to hold tent meetings. From this beginning came the Fisherville Baptist Church. The land for the church was donated by Mrs. Arthur Seymour and her mother, Mrs. Merritt Webb of Fisherville. The group which had met at Mrs. Robertshaw's voted to accept a loan from the Baptist loan fund. Soon the one room church was built. 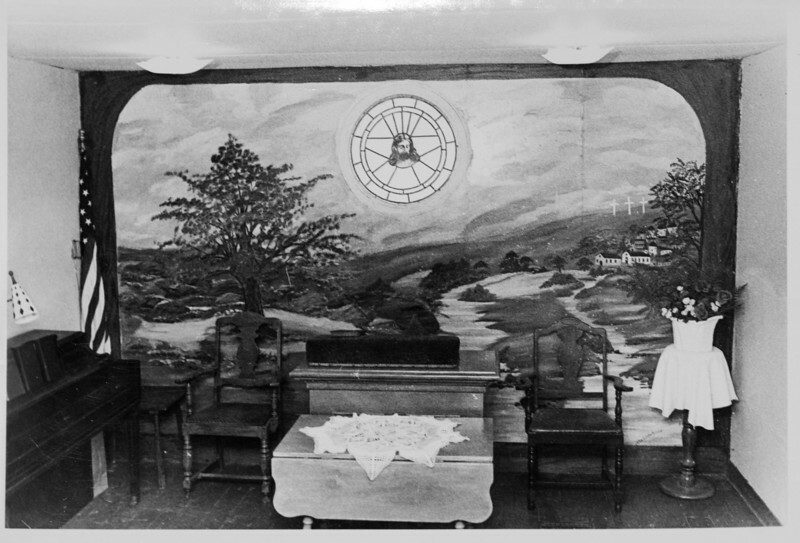 The little congregation wanted something very special for their church, so in 1959 Mrs. Robertshaw painted the mural that fills the wall behind the pulpit. Here is her concept of Bethlehem and the river Jordan and the far hills of Calvary. Mrs. Robertshaw has done work for other churches. One such painting was on consignment from a Waverly Church. For this she used a special paint, painted in reverse on glass, and then baked the finished work which was used as a church window. In the 1950's and the 1960's Mrs. Robertshaw's work began to find recognition. Her paintings have been shown at the Arnot Art Gallery in Elmira, at the Rochester Art Gallery, and at the Syracuse State Fair Exhibit. She has taken first and second prizes at the Chemung County Fairs. For three years, in 1956, 1957, and 1958 she entered work in the world contest sponsored by the Latham Foundation for the Promotion of Humane Education, in Los Angeles, California. Here were shown the work of 26,000 people from 120 countries. Mrs. Robertshaw's paintings, "Dog and Child", "Mother and Child Feeding Fawn", and "Our Native Birds", received an honorable mention award in each of the three years. Mrs. Robertshaw now does paintings on commission and sells the paintings she has done through the years. Many local homes boast proudly of a Robertshaw. Her paintings have been sold in Arizona, New Jersey, West Virginia, Florida and Pennsylvania. Mrs. Robertshaw has been compared to Pickett and Grandma Moses; but her work is distinctive and her medium of murals her own. We of this area are fortunate indeed to have the woods and waters and farms of Chemung Valley seen through her eyes and portrayed with such rich color and integrity. In an article in the November, 1966, issue of the Finger Lakes Chronicle, the editor, Mrs. Joyce Lubold says, "Some day soon the road leading to her house will be marked on every state map, and the spontaneous joy and superb craftsmanship displayed on the walls of her home will be known not only across the state, but maybe across the world." July 6, 1967: Viewed murals and paintings in Robertshaw house in Fisherville, New Yrok. Martha Robertshaw gave background information on paintings. July 8, 1967: Went with Martha Robertshaw to Fisherville Baptist Church. Heard background story of the church mural. 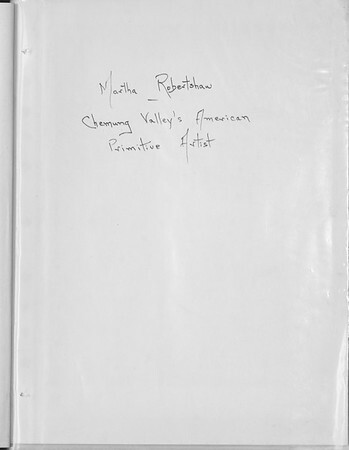 July 11, 197: Interviewed Martha Robertshaw on her life. July 15, 1967: Went with Helen Anderson to obtain photographs of pictures and murals. July 18, 1967: Follow-up interview to obtain additional material on Martha Robertshaw's life. July 21, 1967: Final interview in which Martha Robertshaw checked accuracy of article and amended. Chemung County - - - Its HistoryPrepared by the Writer's Group of the Chemung County Historical Society; c. 1961, Chemung County Historical Society, Inc., Elmira, New York. 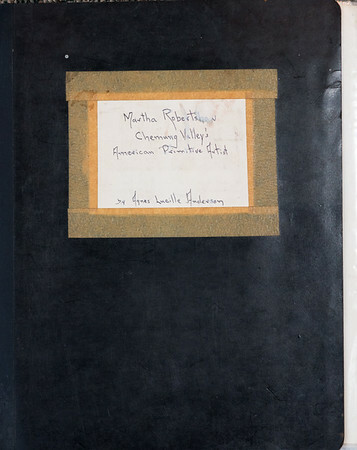 Lubold, Joyce, "Martha Robertshaw", Finger Lakes Chronicle, Vol. III, No. 12 (November, 1966) pp. 7-10.